William Richardson O’Neal IV (Bill) of Clayton, outstanding retired businessman, died peacefully at home on February 13, 2019, following a period of declining health. Bill was born on August 27, 1919 to the late William Richardson O’Neal III and Omega Corbett O’Neal in O’Neal’s Township. He was married for 60 years to the late Ernestine Dodd, who died in 2008. He is survived by their two sons: William Richardson (Rick) O’Neal V of Clayton and David Dodd O’Neal, and wife, Cindy, of Johnston County; three grandchildren: Shannon O’Neal of Raleigh, David Dodd O’Neal, Jr. of Virginia Beach and Olivia Faye O’Neal, of Cary; and one great granddaughter, Pixie Kelly; sister Polly O. Johnson of O’Neal’s Township; several nieces and nephews; special friend, Hazel Strickland, and long-time dedicated caregivers, Deloris L. Adams, Pennie Richardson, Paula Robinson, Rosa Sanders and Julia Story. He was preceded in death by three brothers, Max, Bobby and William Preston, and five sisters, Luna Lee O’Neal, Aline Jones, Mary Lee O. Maddox, Addie O. Narron and Wallace O. Godwin. He graduated from Corinth Holder High School and attended Hardbargers Business School in Raleigh. He was employed as bookkeeper for a Raleigh wholesale distributor and then became a salesman representing the firm. O’Neal was drafted into WWII service in 1941, trained at Monterey, California, and later became a cadet and officer in the U.S. Army Air Corps. He was certified to fly the B-17 and B-24 bombers and was the flight engineer for the new B 29 Stratofortress. After attaining the rank of 2nd Lieutenant and becoming a flight instructor, he was stationed at numerous Air Bases during the war until his discharge on December 24, 1945. Following the war Bill returned to his sales job and married Ernestine in 1946. He left the sales circuit and became a partner in Clayton Motor Company, later becoming full owner of the firm. Thus began his meteoric rise in the automobile sales and service industry. He eventually moved his business as O’Neal Motors to Raleigh. For more than four decades, he was a leader in the Chrysler/Plymouth dealerships and received many awards as the top eastern United States dealer and as one of the elite highest volume dealers nation-wide. He took great pride in the people he selected to become employees and gave them many opportunities and incentives. O’Neal also branched out with numerous other business interests. Always crediting Ernestine for helping him to advance in his business career, Bill, an eager student, took advantage of all the educational and training opportunities available. Together they traveled extensively to trade conventions and also took semi-annual cruises to foreign ports. Not only was Bill a leader in his chosen career, he was also a leader in civic and church endeavors. He was named outstanding Retailer in the State of North Carolina in 1981 and was active in the Rotary Club and Chambers of Commerce of both Clayton and Raleigh, serving in various leadership capacities in each. 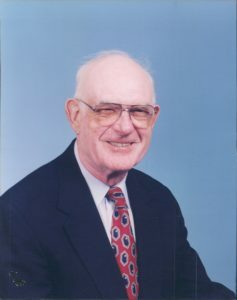 A stalwart and financial leader in First Baptist Church of Clayton, NC, Bill taught a Sunday School class named in his honor for 50 plus years and continued as a member of the Bill O’Neal Adult Men’s Class until his death. He served as a deacon, Sunday School superintendent, Training Union leader and chairman of numerous committees through the years. He was finance chairman and building co-chair for the first fellowship hall addition built in the mid 50’s and he and his wife set up a trust fund that gave impetus to the ambitious $4+million dollar addition to First Baptist Church in 2005. A faithful and generous member of First Baptist, he and his wife made many financial gifts, including funds for the latest refurbishing of the church sanctuary. Bill spent several years chronicling his life during Ernestine’s failing health and he self-published the book “Memoirs of William Richardson O’Neal, IV” in 2008. He distributed the book free of charge but included in the front cover was a packet where any contributions could be made to the special Organ Fund the O’Neals established at First Baptist Church. It was Ernestine’s desire to see a new pipe organ installed and Bill has helped to see that this wish will become a reality in the near future. A trust fund for this and for a mission group’s continued ministry, are part of his named legacy. Funeral services will be held at First Baptist Church in Clayton on Saturday, February 16th at 11:00 am with Dr. Mark White officiating. The family will receive visitors at McLaurin Funeral Home from 6:00 – 8:00 pm on Friday, February 15th and in the Ladies Parlor at First Baptist Church immediately following the Saturday service. In lieu of flowers, memorial contributions may be made to The First Baptist Church Organ Fund at P. O. Box 35, Clayton, NC 27528. Online condolences may be made to the O’Neal Family at www.mclaurinatpinecrest.com. Arrangements are with McLaurin Funeral Home, Clayton.